Students kicked off Career Week 2013 a bit more “dressed to impress” than normal this year thanks to alumni, staff and faculty donations to “Clothes The Deal,” a program through which students improved their career wardrobes (for free!) and better prepared themselves for future job searches. See the full Career Week schedule here. Several dozen students waited in line outside UMBC’s Women’s Center Thursday morning for the first crack at hundreds of pieces of donated business attire: skirts, blazers, ties, and suits. 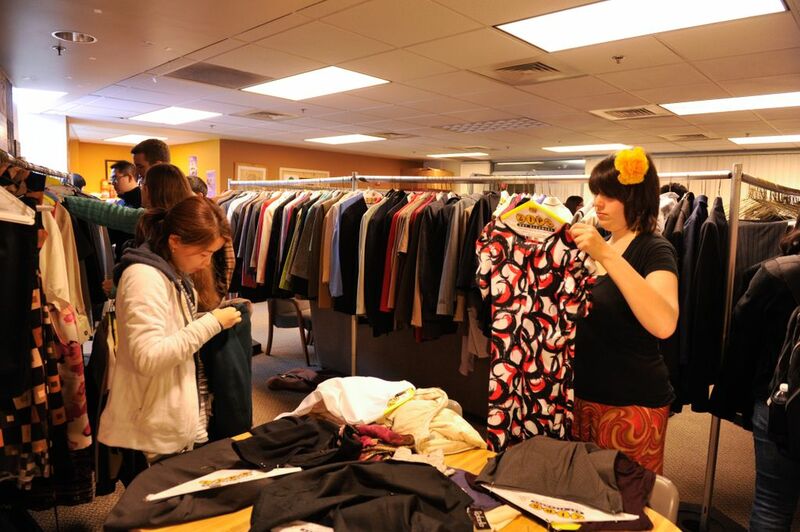 By the end of the event Friday afternoon, 362 students had taken at least one piece of clothing, much of which was supplied by staff and faculty, but also UMBC alumni working at T. Rowe Price — the main sponsor of this year’s Career Week — who organized a clothing drive at their offices. Senior theatre major Amalia Mark left “Clothes The Deal” with a cute little number she plans to wear on interviews for jobs in student engagement. “I got the best dress ever!” she exclaimed, showing off her new frock. Special thanks to the Pikesville ZIPS for donating the cleaning of 300 items for “Clothes The Deal.” Other event sponsors were the Career Services Center, the Student Alumni Association, the Office for Academic and Pre-Professional Advising, UMBC Athletics, Chartwells, the Shriver Center, and the Division of Student Affairs. [Photos] You raised $6K for student scholarships! I have 4 suits I want to donate. Where should I bring them? Active collection of clothing for next year’s drive will begin sometime mid-fall, but if you really want to drop them off before that, you can swing by Alumni House, any time between 9 a.m. and 5 p.m., Monday through Friday.